A bright red safety guard rail protects fingers, and a safety spring keeps the ergonomic soft grip handle from falling. The lock holds the handle in place when not in use. 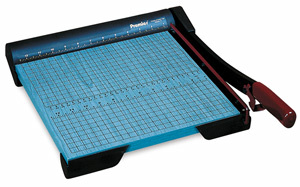 These trimmers have a 20-sheet capacity and feature a slide guide for uniform trimming. Each has a ¾" thick wooden base with a permanent ½" grid and dual English and metric rulers to insure correct alignment.